Cindy, of UsefulBooks.Etsy.com, made this book for our most recent swap. 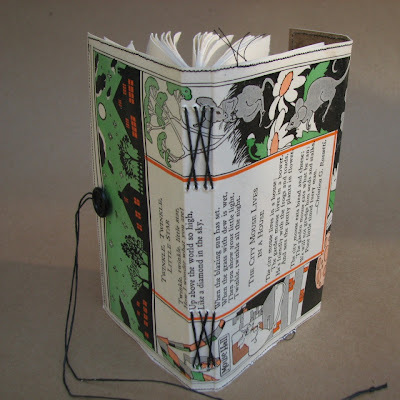 Cindy says that this is one of her favorite books that she's made in this style. 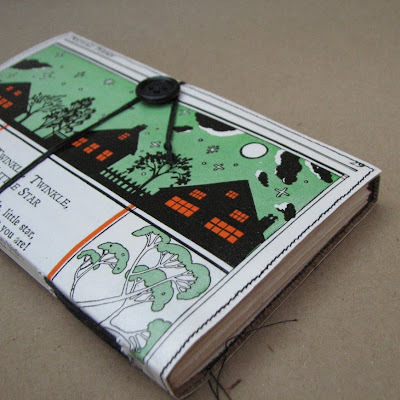 It is a small journal made from a page taken from a vintage children's book, with the text of Twinkle Little Star. The page is layered with Tyvek and Kraft paper for strength and flexibility, then coated with several layers of acrylic glaze to make it durable and water-resistant. Visit UserfulBooks.Etsy.com to see more of Cindy's work. Love it! So very cute! These are fun to make. They make me smile!